The combination of slippery surfaces, strenuous activity and cold can make for back and heart health dangers. (Health.com) -- Since certain parts of the country are in the depths of a "snowmageddon," with more snow predicted, chances are good you might be shoveling a bit -- or a lot. The exertion, cold weather, and slippery surfaces snow shovelers face are a dangerous combination, especially if it's an activity you're not used to. Snow shoveling "is one of the most high-intensity exercises you can do," says Suzanne Steinbaum, a preventive cardiologist at Lenox Hill Hospital, in New York City. "You're using all your major muscle groups." The No. 1 injury suffeered after a snowstorm is lower back strain, according to Dr. Henry Goitz, an orthopedic surgeon at Henry Ford Hospital, in Detroit, Michigan, and a spokesman for the American Academy of Orthopaedic Surgeons. "That's when a muscle gets over-tensioned and tightens," he explains. "If it over-tightens, it's almost like a spasm and that gets very painful." Another common back injury incurred during shoveling is a herniated disk, says Dr. Victor Khabie, the co-chief of orthopedic surgery at Northern Westchester Hospital, in Mount Kisco, New York. A herniated disk (also known as a slipped disk) is when one of the soft disks between the vertebrae comes out of position and pushes on a nerve. If your post-shoveling recovery includes back pain that radiates down your leg, it's a bad sign. "That may mean you have ruptured or herniated a disk," Khabie says. The combination of frigid weather and normally sedentary people going all-out can be a recipe for back injuries. "The shoveling tends to be done by people who are not otherwise in good shape," says Dr. Richard Pomerantz, a professor of medicine in cardiology at the University of Rochester Medical Center, in Rochester, New York. "Sometimes a potato chip is the heaviest thing they've lifted for a while." The snow is not the only danger. Ice lurking underneath snow can potentially cause even worse injuries. Dr. Evalina L. Burger, a vice chair and associate professor of orthopedics at the University of Colorado, in Denver, Colorado, says she has seen no acute injuries from shoveling over the past three years but "horrible injuries from slipping on ice, including bad fractures." 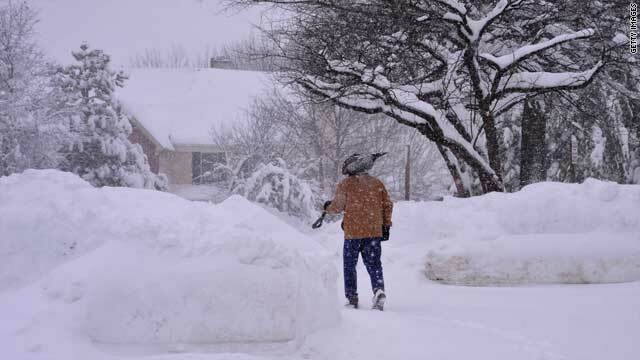 The combination of exertion and cold weather are believed to be the cause of shoveling-related heart attacks. "We don't like heart patients doing tons of heavy weight lifting coupled with cold weather," says Pomerantz, whose home of Rochester averages about 7 feet 8 inches of snow each year. There's both an aerobic and weight-lifting component to snow shoveling, says Pomerantz, and the weight lifting portion can raise blood pressure. "You're increasing the load on the heart very, very quickly when maybe the heart is not used to it," he says. "If you do that in a setting where it's cold, your arteries and vessels tend to constrict, so the relative blood supply goes down at a time when you're asking the heart to do a lot more. Demand is high and supply is low and that can be too much sometimes." Moreover, hormones released during cold weather and exercise can cause plaques -- fatty deposits that line artery walls -- to rupture, leading to blood clots and heart attacks. "If you have plaque in your arteries, this is a perfect time for them to rupture and lead to a heart attack," Steinbaum says. • Stay in shape. People who are in shape year-round have less to worry about when the flakes start falling. • Work up to it. Warm up inside, and incorporate stretches (especially for the hamstrings) as well as core-strengthening exercises such as mini sit-ups, crunches, or working an exercise ball. • Don't try to do it all at once. Shovel small amounts of snow at a time, especially if the snow is heavy and water-laden. "If you're not used to exercising or you've had a back problem in the past, the smart way of approaching this is to do a little bit at a time," says Dr. Khabie. Shovel for 5 or 10 minutes, then go back inside for 10 minutes to do more stretching. • Practice proper technique. The AAOS advises pushing the snow-containing shovel instead of lifting it. But if you do have to lift, "do more of a knee squat, your back arched as if looking to the sky," Goitz advises. Don't bend from your waist. When disposing of the snow, keep the shovel close to your body and, again, squat with your legs, Goitz says. Walk over to where you're going to dump the snow, as opposed to leaning over and throwing it. By no means should you rotate or twist your body. "That's the worst thing you can do for your back in general," says Burger. "That's how you herniate disks." • Pick the right tools. Ergonomic shovels "tend to take the stress off the back," Khabie says. Adds Burger, "The bent handle gives you a better angle. You don't have to go down so far and you don't have to go all the way back up." • Layer with warm clothing. Being underdressed will leave you vulnerable to a painful strain. "You don't want to go out there and really freeze because it will tighten up your muscles," Khabie says. • Wear snow boots with good traction. "If your feet slip, it throws off your entire balance," Khabie says. "Find a good, sturdy snow boot that's made to be out in the snow." Consider keeping a set of spikes in your car, Burger adds. "They take two minutes to put on -- versus six weeks off from work if you injure yourself." For some people, the safest thing to do might be to outsource the job to a son, daughter, or neighborhood teenager who's looking to earn a little pocket money.